Home » Article » How To Delete A Facebook Page? If the purpose of your Facebook page that you created for your brand, business, organization etc. has been accomplished, you can delete it from your Facebook account. 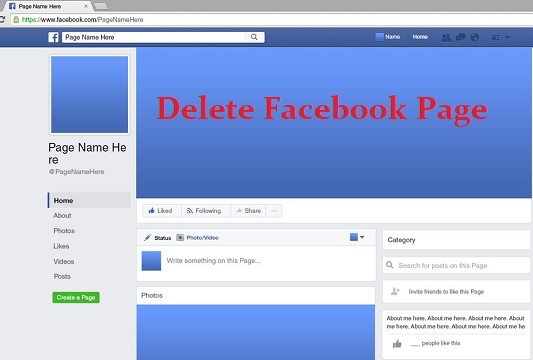 To know how to delete a Facebook page from your Facebook account, follow the step-by-step instructions provided in this guide below. NOTE: You will be able to delete a Facebook page only if you are an admin of that page. 1.) Start by signing into your Facebook account from which you wish to delete your Facebook page. 2.) Once you are signed into your Facebook account, you will need to click on the Pages option given on the left-hand side panel of your FB’s page. This will direct you to the next screen where you will see a list of pages associated with your Facebook account. 3.) From the list of FB pages that appear on your screen, you will need to choose the page you wish to delete. This will direct you to that particular Facebook page in your account. 4.) Now, once you are on the Facebook Page, you will need to click on the Settings option located on the upper-right corner of your Facebook page. This will take you to the Settings section of your Facebook page. 5.) Next, you will need to scroll down to the bottom section under the Settings section (located in the General tab). Here, you will find the option to delete your page under “Remove Page” section. 6.) Here, you will need to click on the “Delete “Facebook Page’s name”. You will be again prompted to confirm your action. 7.) So, simply click on the “Delete “Page”?” button in the prompted box. This action will prompt with a notification that reads – “Page entered deletion mode. You can cancel the deletion within 14 days”. Then, click on the OK button in the notification window to complete the account deletion process. NOTE: If you want you can select the checkbox next to the Unpublish this page in order to make it visible only to the admin of the page. NOTE: You will be allowed to cancel the Facebook Page only if it has not been more than 14 days since the time you initiated the deletion of your page. 1.) Sign in to your Facebook account and go to the Page (within 14 days initiating the deletion process. 2.) Next, look at the top section of your Facebook Page located above the cover page, you will see the Cancel Deletion option. 3.) Simply click on the Cancel Deletion option and then on the Confirm option to cancel the deletion of your Facebook Page. 4.) This action will prompt a message on your screen with a message – “Page deletion canceled”. Just click on the OK button to complete the cancel the deletion of the page. NOTE: In case you don’t find the page anymore listed in the Pages section of your account, this might mean that the 14 days period deletion time of your page has completed and Facebook has permanently removed the page from your account.